Edouard Manet’s Gare Saint-Lazare, a painting he exhibited as Le Chemin de fer (The Railway), has always intrigued as much as it has delighted critics, scholars, and the art-loving public. Shown at the Paris Salon in 1874, the year of the first Impressionist exhibit, this enigmatic work provides a glimpse of the great stone and iron Pont de l’Europe next to the Gare Saint-Lazare where powerful steam engines were sheltered. Symbolizing energy and progress, the railroad became a focus for Manet, Monet, Caillebotte, and many other artists in the decades after the Franco-Prussian War and the Commune. 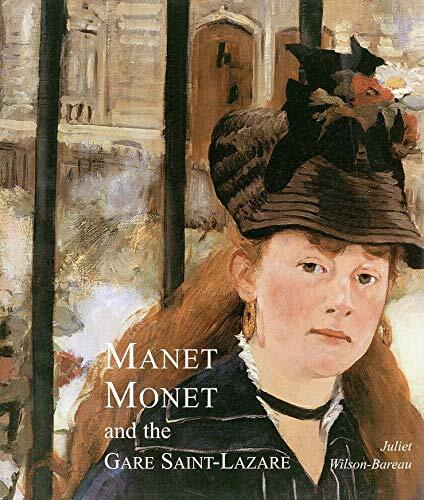 Based on new research into the streets and studios of Paris, this book identifies the precise site of Manet’s picture, painted shortly after his move to a new studio. The book reveals fresh meaning behind the artist’s seemingly straightforward depiction of an urban scene and contrasts his major works of the 1870s with earlier key paintings that also featured Manet’s favorite model, Victorine Meurent. The book also explores the atmosphere of Manet’s studio and his close relationship with poet and critic Stéphane Mallarmé. Along with Manet, other artists celebrated the Pont de l’Europe, the Gare Saint-Lazare, and the Paris skyline beyond, while Monet sketched and painted within the station and down on the tracks, capturing the bustle and energy there. A comparison of Manet’s and Monet’s urban views sheds light on the crucial question of plein air versus studio painting. This book is the catalog for an exhibit that opens at the Musée d’Orsay in Paris on February 9, 1998 and moves to the National Gallery of Art in Washington, D.C. in May, 1998. Copublished with the National Gallery of Art, Washington, D.C. When Edouard Manet first exhibited his painting titled "Le Chemin de Fer" (the railway) at the Paris Salon in 1874, it was universally derided by critics. The "Gare Saint-Lazare," as the painting has come to be known, depicts a seated woman holding a small dog and staring off the canvas, and a young girl with her back to the viewer regarding a railroad track, steam, and architectural details of a Paris city street just beyond an immense iron fence. It wasn't until long after the painting moved into a private collection that the structures forming its background were identified as part of the iron bridge that spans the railway lines just beyond the station and an exact rendition of the facade of the Manet's studio. The "Gare Saint-Lazare" was Manet's first major work after the Franco-Prussian War, and it marked a break with his earlier, more pastoral subjects in favor of those exploring the burgeoning urbanization and modernization of the industrial age.